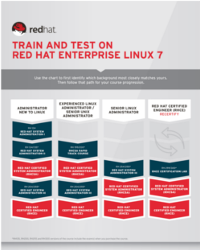 OpenShift Enterprise Development by Red Hat (DO290) is part of a series of courses that focus on using OpenShift Enterprise by Red Hat to automate a portion of the software delivery pipeline. The course will immerse you in a DevOps environment through the use of agile software development methodology, test-driven development, continuous integration, and a standard operating environment through the use of Platform-as-a-Service (PaaS). Through hands-on labs, you will implement user stories for an existing Java EE application and deploy the application to an OpenShift Enterprise instance. You will learn how to create, update, and maintain applications using OpenShift Enterprise. Application Developers (not necessarily Java EE developers) interested in creating OSE applications with automated unit/acceptance tests, deploying those applications using CI to an OSE instance. This course provides the knowledge necessary for you to take advantage of the platform in a popular DevOps environment. This course is part of a series of DevOps courses that center around the use of OSE to enable continuous delivery a key goal in the DevOps philosophy. Control and maintain applications using the OpenShift Enterprise command-line interface.